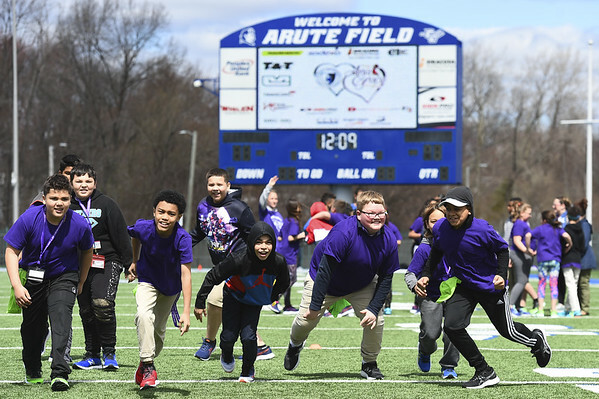 NEW BRITAIN – Approximately 400 fifth-graders from the Consolidated School District of New Britain spent part of their day at Central Connecticut University on Wednesday learning that high school doesn’t have to be the end of the race. The “Love Wins: Finish the Race,” event, was organized by the Ana Grace Project to give elementary school children a taste of college. “The idea is that these young children will get a taste of college from CCSU students and will leave the campus with the belief that after high school there is a world of possibilities awaiting them,” Nelba Márquez Greene, director of the CCSU Ana Grace Project and a family therapist, said. Márquez Greene founded The Ana Grace Project to honor her daughter Ana who was killed during the Sandy Hook Elementary School shooting in 2012. The “Love Wins: Finish the Race” activities started at Welte Auditorium were students participated in a brain break activity and heard short speeches about the importance of higher education. Students also learned about some of the career and degree options offered at CCSU. The afternoon activities include lunch with CCSU students, meeting CCSU athletes and sports demonstrations. Posted in New Britain Herald, General News on Wednesday, 10 April 2019 12:18. Updated: Wednesday, 10 April 2019 12:21.